While we may see photos taken from the International Space Station (ISS) somewhat often as astronauts post them on social media, images of the orbiting ISS from earth are quite the rare gems. That's why Amateur astrophotographer Dylan O'Donnell blew us all away with his breathtaking photo, taken on June 30, of the ISS crossing in front of the enormous luminescent moon. The photo was taken from Byron Bay in New South Wales, Australia. O'Donnell used a Canon 70D camera attached to a telescope to capture the awe-inspiring pic. Opportunities like this don't come around too often for astrophotographers. O'Donnell waited a year to finally receive an online alert for the precise timing of the ISS's flyover. "If you think that it might be a case of sitting there with your camera and a clock, with one hand on the shutter release, you'd be absolutely correct! 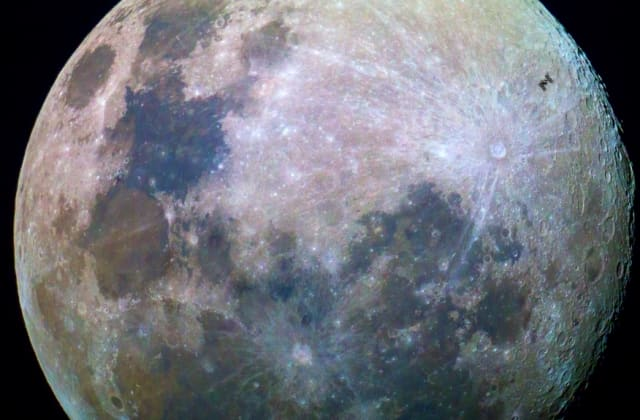 The ISS only passed over the moon for 0.33 seconds as it shoots by quite quickly. Knowing the second it would pass, I fired a 'burst' mode of exposures, then crossed my fingers and hoped it would show up in review — and it did!" We're certainly glad it did. O'Donnell's photo has already appeared on various news sites and social media platforms. A view like this comes along almost never, so take it in and enjoy!